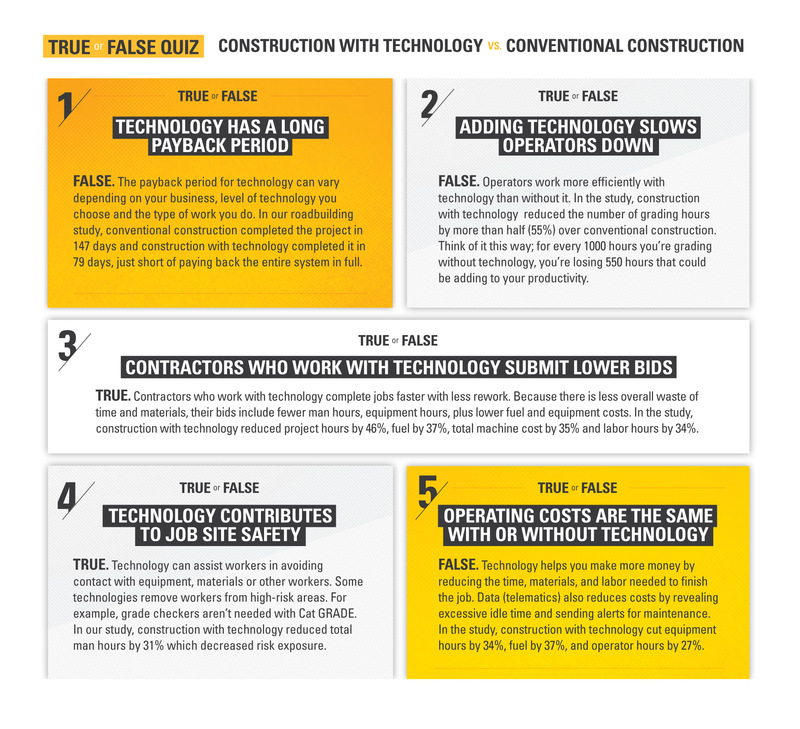 When a fair share of the bids are won, customers are happy and the bills are getting paid, it’s hard for many contractors to believe that their work could be improved by technology. The best way to separate perception from reality is in the work. So, we put conventional construction and construction with technology side-by-side on a job site. Read an Outline of the Article Here. False. The payback period for technology can vary depending on your business, level of technology you choose and the type of work you do. In our roadbuilding study, conventional construction completed the project in 147 days and construction with technology completed it in 79 days, just short of paying back the entire system in full. False. Operators work more efficiently with technology than without it. In the study, construction with technology reduced the number of grading hours by more than half (55%) over conventional construction. Think of it this way, for every 1000 hours you’re grading without technology, you’re losing 550 hours that could be adding to your productivity. True. Contractors who work with technology complete jobs faster with less rework. Because there is less overall waste of time and materials, their bids include fewer man hours, equipment hours, plus lower fuel and equipment costs. In the study, construction with technology reduced project hours by 46%, fuel by 37%, total machine cost by 35% and labor hours by 34%. True. Technology can assist workers in avoiding contact with equipment, materials or other workers. Some technologies remove workers from high-risk areas. For example, grade checkers aren’t needed with Cat GRADE. In our study, construction with technology reduced total man hours by 31% which reduced risk exposure. False. Technology helps you make more money by reducing the time, materials, and labor needed to finish the job. Data (telematics) also reduces costs by revealing excessive idle time and sending alerts for maintenance. In the study, construction with technology cut equipment hours by 34%, fuel by 37%, and operator hours by 27%. Talk to your dealer to find out how technology can help you win more work. Are You Underestimating the Value of Preventive Maintenance? JOBSITE CONNECTIVITY – IS IT WORTH IT?